Edinburgh City Council is facing calls for an investigation into its handling of the recent severe weather so lessons can be learned for the future. Councillor Andrew Burns is seeking an urgent report into the response to the wintry conditions. The local authority said it had used half as much grit in a 10-day period as it did during all of last winter. 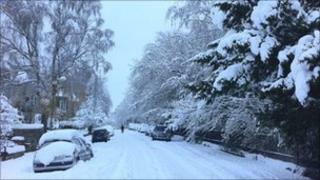 The council papers say that from 26 November the capital suffered its heaviest snowfall for 50 years. Almost 5,000 tonnes of salt was used over the 10 days, compared with 10,000 tonnes from October to April last winter. However, some politicians are concerned at how the situation was handled and how it has been funded. Mr Burns' motion, which will be considered by councillors on Thursday, called for "an urgent report to outline how preparations for, and response to, such winter-weather events can be improved for future years". About 200 privately contracted staff were hired to keep the city moving in the heavy snow, and the armed forces were also paid to lend a hand.